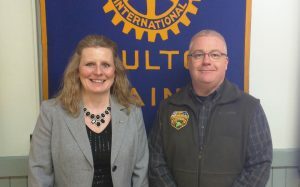 In this photo are Rotarian Annette Beaton with her guest speaker Sheriff Darrell Crandall. Crandall shared the history of his career with the Sheriff’s Department in Houlton beginning with growing up in the jail. The house in the front of the jail was his family’s residence until he was nine years old since his father was the Sheriff and paid so little that housing was provided. The family moved out when a raise came and nine and one half years later Crandall returned to work in the jail. He advanced through the years to the job of Sheriff spending time in drug enforcement and dog handling. Crandall shared some statistics of the department’s work over the years. Crandall has made some changes to improve the department’s rating with programs that improve the prisoner’s lives for the time when they leave the jail. The Houlton jail has inmates that are there less than a year. Longer sentences are served elsewhere. Basic life skills such as making the bed in the morning, dressing for the day, brushing teeth and combing hair and eating well are taught as well as job skills and education. Crandall hopes to make better citizens of the inmates that serve time in the Houlton jail. Crandall will be retiring from his work in the next few months and was commended for his thirty years of service with a round of applause by the club members.